Come and join in the Celebration Of Hope (COH) for an exciting time with songs, skits, dance, mystery, stories of hope! Swipe through the slides of this post to find out more. Event special appearances include our local artistes Olivia Ong, Belinda Ng, Gurmit Singh, Li Nanxing, Noah Yap, Charlie Goh, Annette Lee, Lina Ng and international artistes Eric Mo, Huang Guo Lun, Wong Cho Lam, Kou Nai-Hsin and Kou Shao En. Dance through the night at The Power of Hope festival of joy, and celebrate The Joy of Hope with moving songs and joyful dance. Hear speakers J. John and Kou Shao En share what hope is and how you can find true hope. 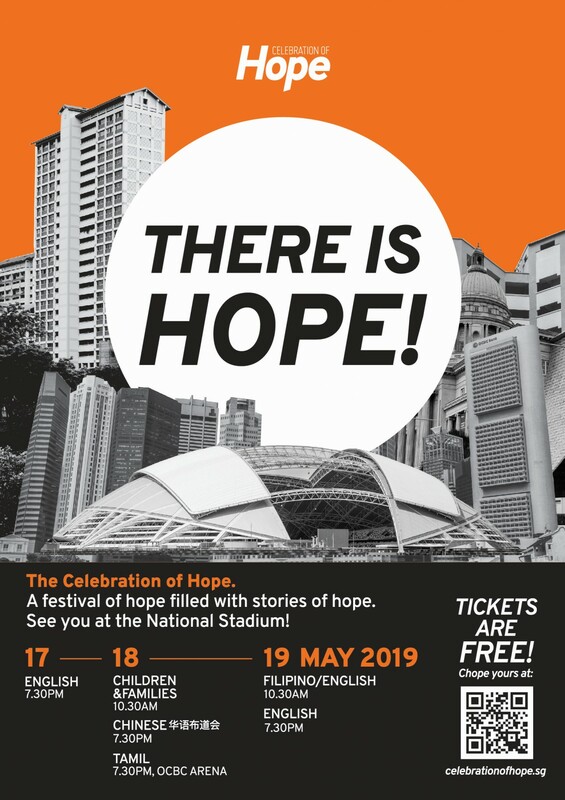 Reserve your free tickets now @ www.CelebrationOfHope.sg/tickets! For more information, please visit www.celebrationofhope.sg, read event flyer, watch this video or email info@celebrationofhope.sg.